That's an ad from Kontera, the people with whom I had so much fun in this column. 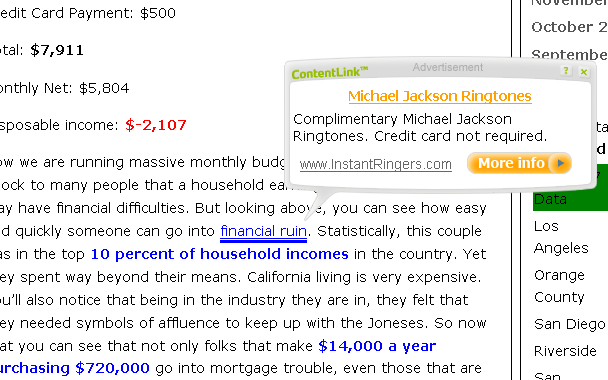 I initially thought it was completely inexplicable that "Michael Jackson" and "financial ruin" were connected strings in Kontera's laughable "contextual" ad database, but it turns out that those two strings have been seen in the headlines of lots of news stories. 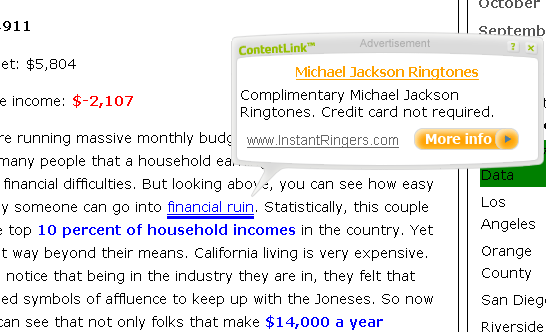 Which is no doubt why Kontera's brainless ad server is linking them together. You can really see why they get paid the big bucks, can't you? Egad, man. I knew I had gotten too comfortable in my ways to ClearType to change, but that text is seriously eye injuring. I hope it was just flipped off for the screenshot. I don't want you to have to turn to contextual ads to pay for your eye glasses. Even better... I just persued the article and I got alink to shopping.com for that same "financial ruin" hotspot... sooooo financial ruin links you to ways to spend money. I guess in this case it's attempting to cause you the finanical ruin. OOoooo.... your goin to... wait... I don't beleive in hell... soooo.. Disneyland maybe? Also, I call that low hanging fruit - too easy... so is Michael Jackson and insinuations of terrible actions with kids of course... but it's on the branch just above the RCC. I mean at least he's never claimed to be the sole authority on morality for mankind. As far as low hanging fruit, agreed. But the fact that they destroy trust in such a pernicious manner means that I hold a special loathing for them. Thus my comment. Of course I don't want to turn this into series of anti-Catholic posts. All religions deserve equal disrespect. Stark, if you haven't already been, I'd like to invite you to check out http://scienceblogs.com/pharyngula/. You might find the conversation there interesting. Well, I wasn't going to reply, but since this is my first stop every day... Yes indeed, those and several more no doubt. If Dan wasn't such a slacker I'd have something else to reply to. Now back to your regularly scheduled blog. Yeah Dan... quit slackin' you slacker you! ;) And really, there's not hardly enough self angst or vitriol in this 'blog' thing of yours. You should work on that. Maybe a bit of self-righteous indignation would go well too! Clearly I'm at work, bored, with nothing better to do than heckle Dan for no good reason. Meh. « Giant clicky not actually clicky, dammit, keyboards in Australia!